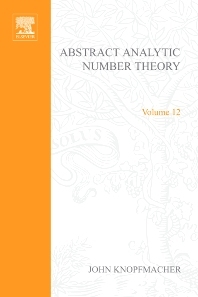 North-Holland Mathematical Library, Volume 12: Abstract Analytic Number Theory focuses on the approaches, methodologies, and principles of the abstract analytic number theory. The publication first deals with arithmetical semigroups, arithmetical functions, and enumeration problems. Discussions focus on special functions and additive arithmetical semigroups, enumeration and zeta functions in special cases, infinite sums and products, double series and products, integral domains and arithmetical semigroups, and categories satisfying theorems of the Krull-Schmidt type. The text then ponders on semigroups satisfying Axiom A, asymptotic enumeration and "statistical" properties of arithmetical functions, and abstract prime number theorem. Topics include asymptotic properties of prime-divisor functions, maximum and minimum orders of magnitude of certain functions, asymptotic enumeration in certain categories, distribution functions of prime-independent functions, and approximate average values of special arithmetical functions. The manuscript takes a look at arithmetical formations, additive arithmetical semigroups, and Fourier analysis of arithmetical functions, including Fourier theory of almost even functions, additive abstract prime number theorem, asymptotic average values and densities, and average values of arithmetical functions over a class. The book is a vital reference for researchers interested in the abstract analytic number theory.